The Wisdom of the ElePHPant project is officially live! I'll be bringing a few to each of Midwest PHP and php[tek] later this year. Mine will be sporting a variety of #ossart, That Podcast, and Sculpin customizations. At the end of last year I was invited to help out with a project that Cal Evans was putting together. The concept was simple. Cal wanted to collect tweetable thoughts, along with a longer bit of supporting text for each thought, to be published as a collection in book form. How could I say no to such a cool project? The books were published in a limited run. The people who contributed to the initial were able to buy a set that they could give away however they see fit. My set arrived on Wednesday but we were asked to not talk openly about it until the book officially launched on Friday, February 5th. 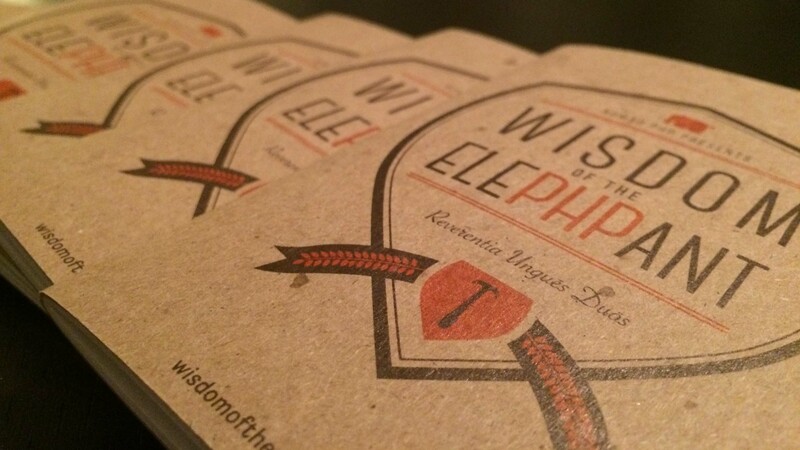 The books are accompanied by a website (wisdomoftheelephpant.com) and twitter account (@wiseelephpant) where the thoughts will be published over time. The website also allows other individuals to submit thoughts to be added to the collection. Have something you want to share with the community? Go submit it now! My selected piece relates to resolving the question of when Not Invented Here makes sense. Specifically, Not Invented Here is not always a bad thing. I touched on this in my Bringing Sculpin to Life talk I gave at Forum PHP last year and kinda ran with it. I had three other submissions selected for the website as well so be on the look out for them as they roll out on the website! I'm looking forward to seeing how this plays out and I am happy I was able to be involved in it! Thanks to Cal and Kathy, the EICC Team!